A MDR-TB patient at a Médecins Sans Frontières clinic in Manipur in north-eastern India. Credit: Bijoyeta Das/IPS. NEW DELHI, Mar 5 2014 (IPS) - For years Joba Hemron, 50, prayed that her cough would go away. She was diagnosed with Tuberculosis (TB) in 2011. She was put on a Directly Observed Treatment Short-course (DOTS), provided free at a public health clinic in Bongaigaon district in Assam. But soon she began missing too many doses. “My sons work in the fields, I was too weak to go on my own to get the pills,” she says. She went to a private clinic, hoping to collect all the medicines at once. That was expensive, which meant she could again not complete the course. "Each time the patient moves from one doctor to another, physicians tinker around with the drug combination, further worsening the drug resistance." Three years and five doctors later, she kept losing weight. “I took medicines whenever convenient but I was only getting worse.” Her family sold a goat and with the money traveled to the state’s capital, Guwahati. She was diagnosed with multi-drug resistant TB (MDR-TB). “I don’t know what this means, no one explains anything. Will I get well?” she asks. Her frail body shakes as cough rakes her lungs. For many like Hemron, lack of proper diagnosis and interrupted dosages are increasing their resistance to available drugs. Drug resistance is human-made – an iatrogenic disease resulting from mismanagement of TB, experts say. Drug resistant TB can occur as a primary infection or develop during a patient’s treatment. India accounted for the greatest increase in MDR-TB in 2012 with an estimated 64,000 new cases. India provides free TB treatment through the Revised National Tuberculosis Control Programme (RNTCP), which reaches 1.5 million patients. TB remains the deadliest infectious disease in the country with two deaths every three minutes. India has more than a quarter of TB cases globally. Ramanan Laxminarayan, vice-president of the Public Health Foundation of India says the national TB programme is “stuck in the 1990s.” It is yet to rope in all available tools and involve the private sector. “Every case of MDR-TB can be 20 times more expensive to treat than a sensitive strain and cause much greater inconvenience, pain and suffering for the patient,” he adds. Despite regular adherence to medicines, some patients are becoming resistant to frontline drugs. In Mumbai, doctors at Hinduja Hospital said they had identified patients who are “totally drug resistant,”and did not respond to any available drugs. The Indian government rejected the claim. According to the World Health Organisation (WHO), about 450,000 people contracted DR-TB in 2012. About half of them are in India, China and Russia. An estimated four-fifths of DR-TB cases are still undetected. 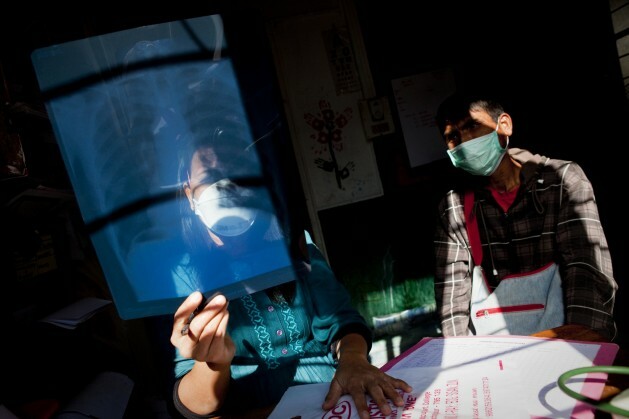 There were 170,000 MDR-TB deaths globally in 2012. Madhukar Pai, associate director at McGill International TB Centre, a research organisation situated at the McGill University Health Centre in Montreal, Canada, explains that neither public nor private healthcare providers offer quality TB care. He says there are many instances of wrong drug regimens, low quality drugs, scarce monitoring of treatment adherence, patient movement between providers, adding single new drugs to already failing regimens, and inadequate use of drug-susceptibility testing. All this results in MDR and extensively drug resistant (XDR) TB. MDR-TB treatment is expensive, the treatment often lasts up to two years, with increased risks. Access to the two new MDR-TB drugs— bedaquiline and delamanid, remains limited. They are available in India only through compassionate use mechanisms. Most patients in India go the private sector but some abandon treatment because of high costs. By the time patients end up in public hospitals they infect many, and also develop severe forms of drug resistance, Pai says. “In the private sector, irrational TB prescriptions are so common – doctors make up their own drug combinations. This is disastrous. And each time the patient moves from one doctor to another, physicians tinker around with the drug combination, further worsening the drug resistance,” he says. About 10 percent of drugs in India are estimated by some doctors to be fake, which can muddle up treatment. Testing for drug-resistance is limited in the public sector. “Empiric treatment is used,” Pai says, not treatment that is tailored to a patient’s drug susceptibility profile. This results in selection of drug resistant strains. The solution isn’t “merely technological”, says Mike Frick of the Treatment Action Group, a research and policy think thank based in the U.S.
New diagnostic machines like GeneXpert may uncover more cases of drug resistance but “it cannot solve the health system’s failure to link patients to the highest level of care that is their right,” says Frick. India fails to provide psycho-social and economic support for patients. Globally, funding for research into TB has fallen. Governments have slashed budgets; Pfizer and AstraZeneca have abandoned anti-invectives research – increasing the wait for better drugs, diagnostics and vaccines. “It decreases our chances of replacing toxic drugs in the current MDR-TB regimen with newer, safer drugs that are easier for patients to tolerate,” Frick tells IPS. In 2013, there were numerous reports of drug stock-outs in India, which the government denied. Many patients had to stop treatment; others were turned away from clinics. When treatment is incomplete, it creates an opportunity for drug-resistance to develop. “The cruel irony is that even as Indian generic manufacturers continued to produce many of the TB drugs that people in other countries depend on, the Indian government couldn’t guarantee TB drug availability to its own people,” Frick adds. TB is an opportunistic disease and HIV positive patients are more susceptible. Daniel, who asked only his first name be used, is a HIV positive patient. Six months ago he was diagnosed with MDR-TB. “The medicines are so hard, drain me of all strength,” he says.